From our base at Ismailia we commenced hunting southwards, down to the Bitter Lakes and eventually to Port Suez/Port Ibrahim. 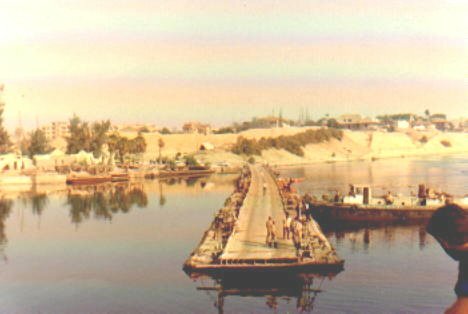 At intervals along the canal were pontoon bridges built by the Egyptian army to supply their forces etc on the Sinai side of the canal. 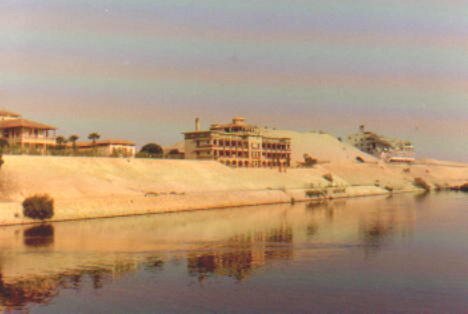 The Egyptians were not too fast at moving these bridges to let us through, although it could be speeded up by placing the MAXTON`s bow against the bridge and giving a "gentle nudge" with the AR`s. It worked wonders! South of Lake Timsah were the Bitter Lakes. 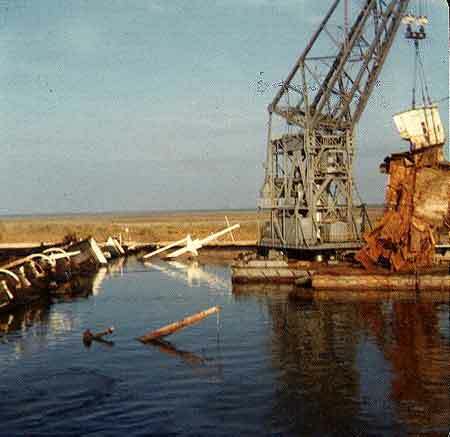 After clearing the channel, we visited the merchant ships which had been trapped in the Canal by the war. 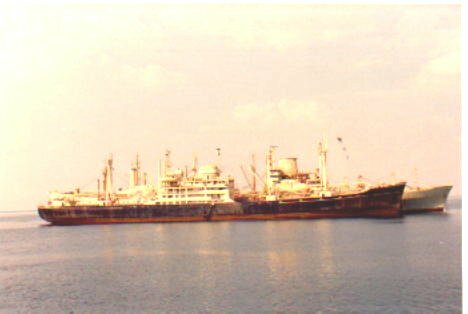 These ships were moored together and manned by a party of shipkeepers to try and keep them in some kind of shape to be moved. We helped by using our divers to clear the underwater inlets/outlets on their hulls. 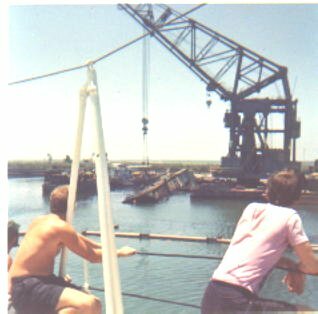 They responded by inviting us onboard for big eats and a few wee drinkies - as well as what we could "salvage" from the cargo. I seem to remember a certain Irish POME having an electric organ in the PO`s mess, numbers of expensive cameras appearing onboard, transistor radios blaring out and everyone wearing purple tee-shirts! And thats only the stuff I know about! By coincidence, whilst on leave after the operation, I ended up working for a short time in Lloyds of Londons Communications Office (just trying to earn a few extra quid!). When the underwriters realised that I had recently been onboard the ships in the Bitter Lakes I was besieged by questions from the money-grabbin` sods, all only interested in how their investments were doing. Needless to say, the removal of several items of their precious cargoes was not mentioned!! 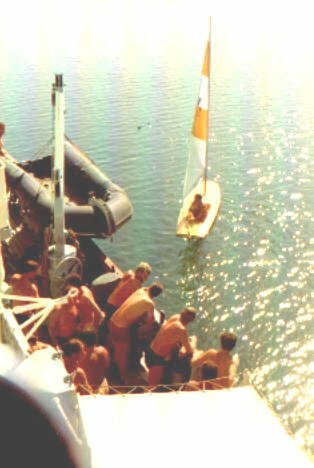 It wasn`t all work.....we did manage to do some sailing and a bit of water ski-ing (The photo above is pretty crap - I`ll try and get a better copy from one of the lads). 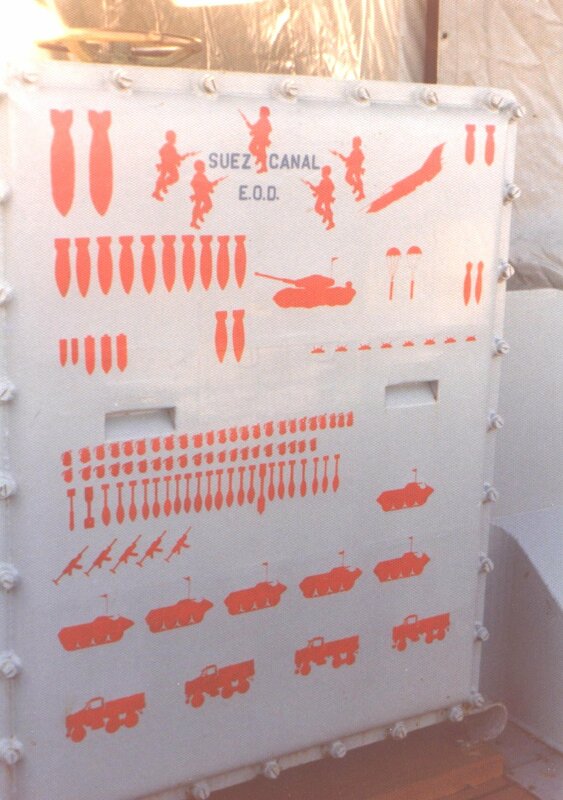 The Egyptians on the canal banks must have thought we were a wee bit crazy (would`nt be far wrong there then). 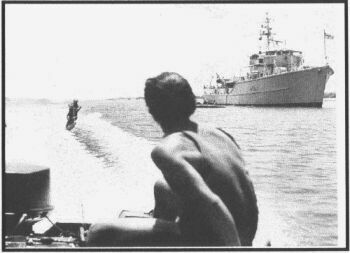 Whilst hunting in the Bitter Lakes the minehunting sonar detected what was described as a "possible aircraft". Our divers were sent down to confirm and identify the contact. 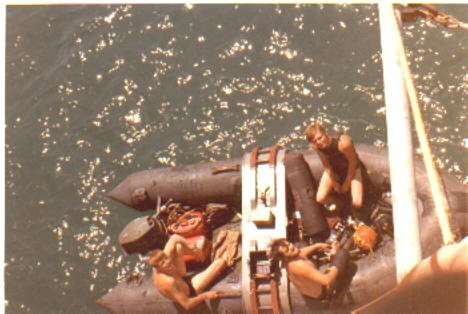 On return they reported that the aircraft was an Israeli F4 Phantom and preparations were made to blow it to prevent it getting into the wrong hands. Little did we realise that due to the very poor visibility in the Bitter Lakes, the divers had only been able to make an identification by touch. We consequently laid charges and blew the aircraft, completely destroying it. The Chief Diver, John Dadd, then went down to confirm that all was destroyed, and picked up a few small pieces of wreckage to return onboard. Once we looked at the parts, and realised that most Phantoms did not have Russian Cyrillic markings on engine parts, it became apparent that perhaps it was`nt a Phantom but a Mig21. Oh Sh--t! We were not the most popular minehunter on the Canal then having lost any chance of removing sensitive equipment for intelligence purposes. Consequently we did not spend our next standoff in Ismailia but anchored in the Canal and kept a very low profile. Still, you can`t win them all!